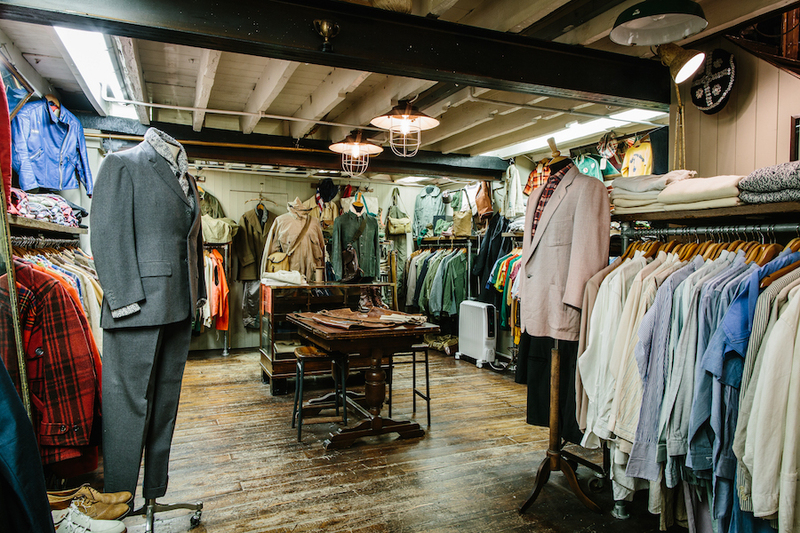 Located on Earlham Street, a cobbled street leading off Seven Dials which dissects the hustle and bustle of Covent Garden, London, lies the flagship store of what is without a doubt one of the largest collections of vintage menswear in the world. 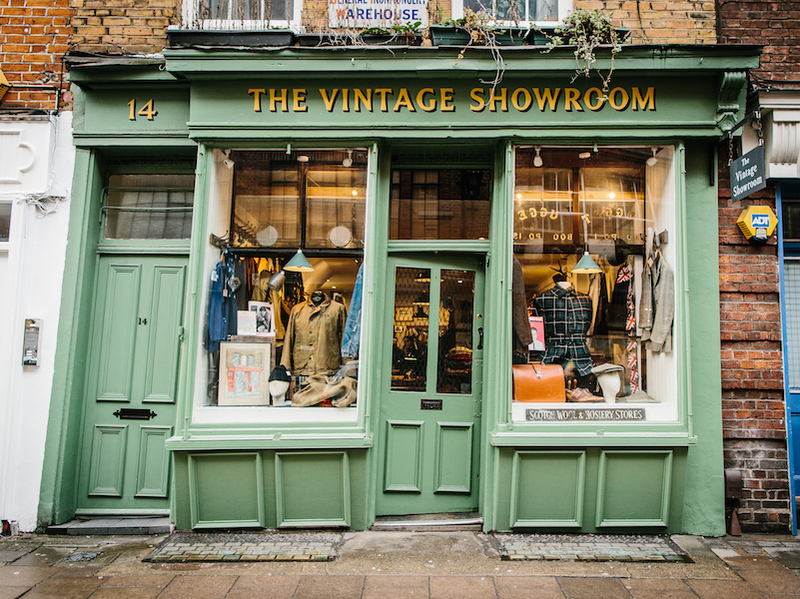 Founded in 2007 by Doug Gunn and Roy Luckett, who joined forces following years of both individually selling vintage on Portobello Road in the early-2000s, The Vintage Showroom defines the epithet, ‘a hidden gem’. Together, they’ve amassed a highly respected and vast collection (around 50,000 pieces) of particularly rare vintage clothing. Encompassing military pieces, workwear, sportswear, tailoring and many unique, and unusual items from all over the world, it transcends most of the 20th century, with exception of the 1990s, which isn’t vintage, yet. They cite that “having different styles definitely helps with the collection,” which explains Doug’s heavy, raw denim jacket and jean ensemble, compared to Roy’s pared down tailored, quintessentially British approach. It comes as no surprise then that their collection is one of the most resourced archives in the world, serving as a seed of creativity for many up-and-coming and already established designers (names of which I’m not allowed to disclose) who visit their showroom in Notting Hill. “We are just on the end of the design process. I love following up with designers and finding out where they went with that one detail. When a designer comes to us, they are looking for something new. They’re looking for a pocket they've never seen before or a fabric or wash,” Doug informs me. "I love following up with designers and finding out where they went with that one detail." “This is really about retail,” explains Doug, as we stand in the basement of the pleasantly crammed, creaking oak-floored, rustic store. “It’s an introduction to the business if you like, whereas the showroom hosts fashion designers, stylists, film wardrobe and costume designers and the occasional personal shopping experience,” Doug says. As you look around, there’s not one element or article of clothing or accessory that seems out of place. It’s a perfectly curated, friendly space that will swallow up your day as your fingers flick in between the many coat hangers (and I am glad it’s come to my attention). It’s safe to say that both Doug and Roy are fully fledged experts in 20th century clothing. They have an encyclopaedic knowledge of various world cultures and their specific styles of dress, and are able to discuss at great lengths the differences, reasons and explanations between the varying technical aspects of military and aviation wear — from pre-WW2 through to Vietnam. They understand the complete breadth of British tailoring by decade, plus a concise understanding of denim, its origins and how different countries developed the fabric in their own, unique ways. Doug has been curating Belstaff's arcchive over the past year and the first reveal is available to see now in Belstaff's New Bond St flagship through London Fashion Week. Ahead of our encounter in their only store, I asked the co-founders to bring along some of their favourite pieces to discuss to which they thankfully agreed. This is because they keep their most valued, both monetary and sentimental, pieces in their showroom in Notting Hill. “What I like about military clothes is that everything has to be fit for purpose,” says Doug, as he runs me through a canoe jacket designed by Belstaff for the SAS, circa 1960. Interestingly, up until the 1990s, Belstaff had military contracts and was designing military garb before it became a motorcycle company. It’s thought to be one of two remaining pieces, and the other currently resides at the Imperial War Museum. Made from densely woven cotton, it’s totally functional with large pockets for maps and other bits of kit, whilst there’s a compartment on the back, presumedly for the person behind you in the canoe. The functionality, stripped down simplicity and raw purposefulness of it, is what modern designers like, according to Doug. "Hung On You is now defunct, but back in the 1960s it was incredibly popular boutique, frequented by the likes of The Rolling Stones and The Beatles." Whilst the shop and the showroom have rails upon rails of outerwear, trousers, knitwear, shirts, footwear, siren suits and other oddities, the duo’s tailoring is also in great order, with stand out jackets in great condition being worn by the many old-school mannequins in the shop. “This is a frock coat by Hung On You,” explains Roy as he runs me through the forest green, double breasted, wide lapel coat. Sadly, Hung On You is now defunct, but back in the 1960s it was incredibly popular boutique, frequented by the likes of The Rolling Stones and The Beatles. “They were on the Kings Road, but it’s quite unusual as this company didn't run for long, which is why I like it.” Roy then pulls from the bag two stunning, striped boating blazers, both from the 1930s. Still in great condition, albeit with a minor scuff here and there that just adds character. These are unfortunately not for sale. But you wouldn't want to wear them would you? They’re so fantastic they're deserved of framing and hanging. Doug and Roy are safeguarding history’s garments. There’s no two ways about it, and there’s not much difference in their role in history compared to the Natural History Museum’s. 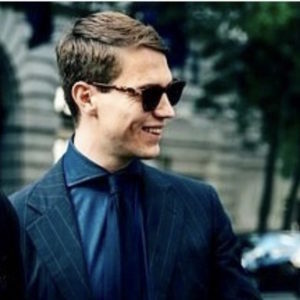 You’d be surprised to learn of the names of those at the forefront of luxury menswear who’ve sought inspiration from it. But, while their showroom is to be explored (stay tuned), their store in Covent Garden is sublime. Its rustic, non-perfectionistic approach to the interior is a breath of fresh air, and venturing there with no specific article in mind is suggested. There’s something for everyone, and it will no doubt trigger sentimental nostalgia, and subsequently complement your wardrobe.